Quoted price for 7-piece with male lead vocals but available in line-ups from 3 to 8 pieces. 2½ hours playing time with recorded music in breaks. What’s got 14 eyes, 3 horns and loves to party? The answer is a uniquely entertaining band called One Jump Ahead. Playing the irresistible blend of jazz, blues and fun called jump/jive music, they have over 150 songs in their repertoire to get people dancing and enjoying themselves! With a seven-piece line-up, One Jump Ahead is led by singer, saxophonist and songwriter, Kit Packham, who is joined by some of London’s top jazz professionals on piano, guitar, bass, drums, trumpet and another saxophone. The band plays material ranging from the classic jive music of the 1940s of which the great Louis Jordan was the most famous exponent, through to rock’n’roll, rhythm’n’blues and soul. On the way, the band takes in some classic swing and jazz numbers recorded by artists such as Duke Ellington, Louis Armstrong, Fats Waller, Nat King Cole and Billie Holiday. 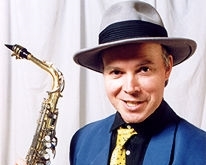 Kit Packham’s One Jump Ahead is now accepted as probably the best jump/jive/jazz band in the country and Kit’s three CDs have been widely acclaimed and played on BBC Radio 2, Jazz FM and local radio stations. Press comments include: "Class exponents of the jump-jive oeuvre" (Time Out); "Vigorous jump-jive and R & B" (Daily Express); "London’s most consistent and entertaining jump-jive specialists" (TNT); "…tight jazzy arrangements … the band impresses with some stylish playing" (Highly Strung). Not surprisingly, One Jump Ahead is an extremely popular band for weddings, parties, corporate events and receptions of all kinds. As Kit puts it: "We have wowed audiences from Islington to Israel, Clerkenwell to County Cork and from Docklands to Deustchland!" The infectious rhythms, humour and style of the band is great for breaking down barriers and getting audiences of all ages on the dance floor, and during quieter moments the band also has the flexibility to provide cool, jazzy background music. The band normally plays for two to three hours and brings its own professional PA system, through which they can also play CDs during their breaks. Our quoted price is for the seven-piece line-up, but a smaller or larger band can be put together by special request. One Jump Ahead is based in London. See Pricing for details of travel costs, etc. "We liked the thoughtful way they related their songs to the event and location they were playing at. They also did a great job of judging the mood and encouraging people onto the dance floor." "Absolutely brilliant - great mix of music, really high quality and loads of fun." "One Jump Ahead were fantastic, they hit the right tempo to get all ages up and dancing at our wedding which created such a wonderful atmosphere of celebration. So many compliments on the band - we couldn't have asked for better!!" "Lots of compliments from our guests!" "Many, many comments from guests at the wedding praising the group. The bride has gone as far as to ask me to seek out a cd of their music! Thank you to the whole group." "Just a quick note to thank you for your help in securing One Jump Ahead to play at our wedding. Could you please pass on our thanks to the band? They were absolutely fantastic, and many guests commented on how good they were." "Absolutely delighted with One Jump Ahead." "What a performance you put in at our wedding ... We wanted to say a big thanks because you guys managed to pack out the dance floor all night long. Nearly all the guests remarked on how great the band was & everyone got up to boogy, including my 80 year old great aunt! Many felt that you 'made' the wedding. So thanks again, we will be absolutely recommending you to anyone looking for a band for any occasion." "The band were fantastic, they really added to the day and helped our wedding become everything we hoped for! Thanks." "Fantastic service, the band were brilliant and made our wedding party - we'd recommend you both. Thank you." "Very professional service from Function Junction. Band absolutely terrific!" "Superb!! They even sang Happy Birthday to my Mum. Very good - thank you very much"
"Thoroughly enjoyed the performance - One Jump Ahead made our wedding reception! Generally excellent and will definitely be recommending you to others!" "Absolutely awesome - the guys were fantastic!" "One Jump Ahead were excellent (even a member of the bar staff commented on their quality!) Guests enjoyed dancing to their music, which enhanced the general theme of the evening - Hollywood Glamour." "They were totally brilliant, completely helped to make our day perfect. This was despite us running late and often quite dodgy electrics!" "Fantastic! We've had lots of comments about how great they were, and a wonderful service from Function Junction - prompt and professional - thank you"
"All our guests kept asking where we had got them from - they were fantastic - judged their performance accordingly to the audience very well. Friendly and good fun - I would book them again for a party. Please pass on our thanks to them." "The band were perfect - the dance floor was packed all night. From start to finish Function Junction were helpful and professional. We've recommended both to all our friends." "Superb music - made the whole reception evening go with a swing." "Everybody loved them, they had everyone dancing, did requests and played all night!" "The Band were excellent. They played the type of music we had requested and tailored their numbers to the guests' response so that the dance floor was well occupied by young and not so young. Flexible and sensitive to the audience - a great success, and nice people too!" "The band were excellent, everyone was dancing and I would recommend them to anyone." Why Keep A Dog & Bark Yourself?